We Offer 24/7 Emergency Call Out Services, Along With Field Inspections, Small/Large Repairs, And Full Strip And Reline Jobs. A 40,000 Pound Large Vessel In Our Facility To Be Re-Rubber Lined Internally. Thermal Polymer Systems, LC , a privately held American Limited Liability Company, is a leading applicator in the rubber lining and specialty coatings industry, and a major source of innovation and competency along the Texas Gulf Coast. For over 25 years, we have provided the expertise necessary to assure a quality lining job that meets our customers’ demands for quality, cost, and delivery. Whether a small repair in our shop, or any size field project, Thermal Polymer Systems is dedicated to furnishing our customers with an exemplary completed project, upheld to the highest standard in quality of work and safety, completed in a timely manner, and promoting cost efficiency as a priority. Owners, Donnie and Darla Murrell, draw on many years experience not only in the rubber lining industry, but also structural steel, pipe, and sheet metal fabrication, setting up ASME code facilities, pre-form fabrication spray systems, developing thermal spray equipment and technology, and establishing operations and liaisons with international ventures. We hold maintenance and repair contracts for more than 85 different chemical plants, refineries, nuclear power plants, and energy companies in the southern United States. 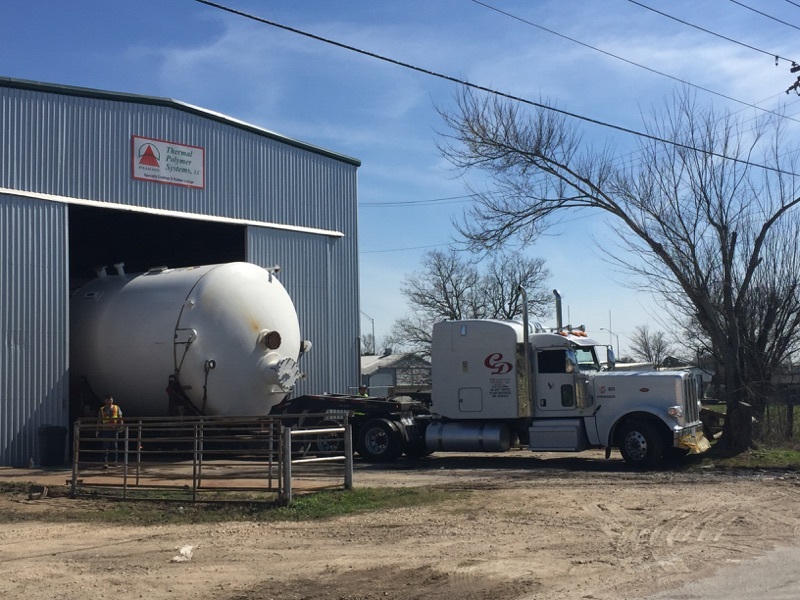 Our company provides a variety of services, which include executing a turnkey refurbishment of Demin Water Tanks – Cation, Anion, and Mix Bed Lines. Either in the plant, or shipped to our facility, we can perform complete disassembly, strip-out, and relining interior, ASME code weld repairs, replacing all the laterals and filters, repainting the outside, and shipping the vessel back to the plant for their utmost convenience. Whether a big job, or a small one, we strive to meet your needs and specifications. Call today and speak with one of our knowledgeable staff members and get a quote! Copyright © 1994-2019 Thermal Polymer Systems. All Rights Reserved.